Report Prioritizes Big Missions to Mars and Jupiter, But Can NASA Afford Them? An expedition to see if some form of life ever existed on Mars and a journey to Jupiter's icy moon Europa to study its underground ocean should be NASA’s highest-priority missions in the next decade, a new report from the National Research Council suggests. The report, entitled "Vision and Voyages for Planetary Science in the Decade 2013-2022," was released today (March 7) after an in-depth review to outline the greatest needs for planetary exploration in the next decade. NASA's current budget woes, however, might delay some or all of these missions, the report warns. NASA, like all federal agencies, is currently operating without an official 2011 budget – the government is working under a temporary spending measure called a continuing resolution. The report suggests NASA's highest priority large-scale planetary science mission should be the Mars Astrobiology Explorer Cacher (MAX-C), one that could help determine whether the Red Planet ever supported life. This mission will be the first step in a multipart effort to eventually return samples from Mars. "We've achieved a great deal when it comes to advancing our knowledge of Mars in the past 15 or 20 years, but our understanding has reached the point now where the big advances in the future come from actually getting samples back to Earth," planetary scientist Steven Squyres of Cornell University, chairman of the committee that wrote the report, told SPACE.com. "There are severe limitations to what can be achieved with the miniaturized instruments we send to Mars — they'll always be much less capable than the best instruments and labs back on Earth, so really fundamental questions, particularly whether Mars was habitable in its history and whether life took hold there, really requires samples taken back to Earth," Squyres added. However, the committee that wrote the report also stressed that MAX-C should be conducted only if it costs NASA about $2.5 billion, or $1 billion less than the independent estimates provided to the committee. "We think with $2.5 billion, the key science missions for MAX-C should be achievable," Squyres said. NASA and the European Space Agency (ESA), which would run the mission jointly, should work together to reduce the scope of the mission and ensure that both agencies still benefit, the report added. 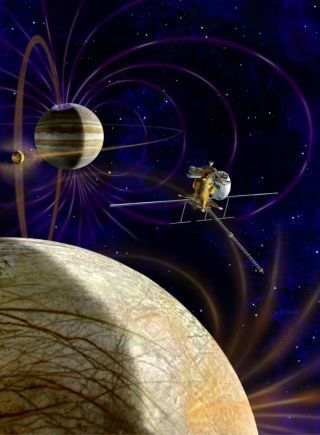 The second-priority large-scale mission should be the Jupiter Europa Orbiter (JEO). "There are very good reasons to believe Europa has an ocean, which is probably under a relatively thin layer of ice," Squyres said. While JEO would not seek to tunnel into this ocean, "it could investigate the thickness of the ice cover, find thin spots, and investigate what the ocean might be like," he explained. However, the committee said NASA should fly this spacecraft only if costs for JEO come down and the agency's budget for planetary science increases. Independent estimates put the price tag for the mission at $4.7 billion, and unless it becomes more affordable, the committee said that carrying it out would preclude too many other important missions. One way to lower costs might involve using a larger launch vehicle, which would shorten and simplify mission design, the report noted. A flagship mission for Uranus? The third priority for a large-scale mission would be the Uranus Orbiter and Probe mission, the first to explore the internal structure and composition of an "ice giant" planet. "There is much to learn about these ice giants — this is exploration in its truest sense," Squyres said. The committee said the Uranus Orbiter and Probe mission should be initiated between 2013 and 2022, but that it should also be subjected to rigorous, independent cost-verification throughout its development and reduced or canceled if costs grew significantly beyond its estimated $2.7 billion price. When it comes to medium-size missions, the committee recommended NASA select an extra two missions for its New Frontiers program, which explores the solar system with frequently launched, mid-size spacecraft. These included seven candidates "that I find all exciting," Squyres said. The Comet Surface Sample Return mission will return samples from the nucleus of a comet. "Comets are among the most fundamental and primitive building blocks of planets," Squyres said. "They can tell us about the starting material the solar system was formed from." The Saturn Probe would fly into the ringed planet to sample its atmosphere. The Trojan Tour and Rendezvous mission would explore the so-called Trojan asteroids, which share the same orbit as Jupiter, either leading or trailing the largest planet in the solar system. "They're very unusual, and we know next to nothing about them," Squyres said. The Venus In Situ Explorer, which would be the first spacecraft on Venus since the Soviet landers in the 1980s, and the first there equipped with modern scientific instruments. The Io Observer, which would orbit Jupiter to observe the spectacular activity of its highly volcanic moon Io. The Lunar Geophysical Network, which would distribute sensors across the moon to use seismology to look at the nature of the lunar interior. The report did not prioritize which of these seven should be chosen. Instead, the committee suggested the selection process should be based on competitive peer review. The report also did not make any specific recommendations for small missions. Still, it noted that NASA's Discovery Program of low-cost, highly focused planetary science investigations has made important contributions to science and should be continued at its current level of funding with adjustments for inflation. The committee also endorsed the Mars Trace Gas Orbiter, a small mission outside the Discovery program due to launch in 2016 to assess the geological and possibly even biological sources of trace gases such as methane, as long as current plans for dividing responsibilities and costs between NASA and ESA remained. Given the current economic crisis, however, if NASA's budget over the coming decade cannot support all of these missions, the agency should preserve smaller-scale missions in its New Frontiers and Discovery programs first and delay some or all of the recommended large-scale missions, the committee said. "Our recommendations are science-driven, and they offer a balanced mix of missions – large, medium and small – that have the potential to greatly expand our knowledge of the solar system," Squyres said. "However, in these tough economic times, some difficult choices may have to be made. With that in mind, our priority missions were carefully selected based on their potential to yield the most scientific benefit per dollar spent." The National Science Foundation, which supports nearly all areas of planetary science except space missions, should expand its funding for existing laboratories and establish new facilities as needed, the report added. The committee also urged the NSF to complete the Large Synoptic Survey Telescope, which could detect hazardous near-Earth objects and help analyze main-belt asteroids, Kuiper Belt objects and comets.